– Some thoughts on the origins of the famous Bar-None M.C.C. The North Africa Campaign (10 June 1940 to 13 May 1943) had a great influence on military motor cycle design and use. 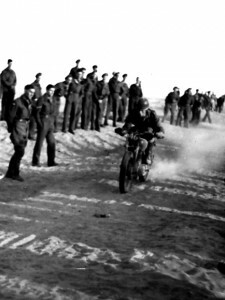 Articles published in ‘The Motor Cycle’ and ‘Motor Cycling’ during this period demonstrate the keen involvement of service personnel, many of whom had been avid motor cycle riders and racers in their pre-war lives, in the improvement and adaption of their machines for local conditions – conditions that ranged from rock strewn mountain-sides to torrential rain, mud and desert sands. The lessons learned were clearly applied when, for example, developing the panel-tank, girder forked Matchless G3-WO into the much improved G3L with its teledraulic forks, lighter weight and increased ground clearance. 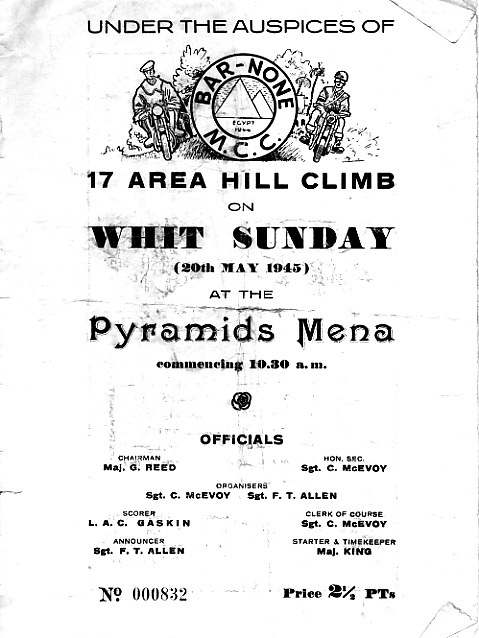 Also evidenced by press articles both before and throughout the war was the widespread participation of Service personnel in competition events which were considered fertile grounds for promoting skilful riding technique. With the North African campaign successfully won the military authorities now had the problem of gainfully employing thousands of battle hardened troops who would might otherwise stagnate and, who might also concoct their own diversions. So, by the end of 1943 the authorities were positively encouraging the formation of a wide variety of clubs, activities and events and into this arena stepped a nucleus of enthusiasts with the idea to start a motor cycle club; a club that was to become famous throughout the Middle East, a club that was reported upon in the press at home; The ‘Bar-None Motor Cycle Club’. 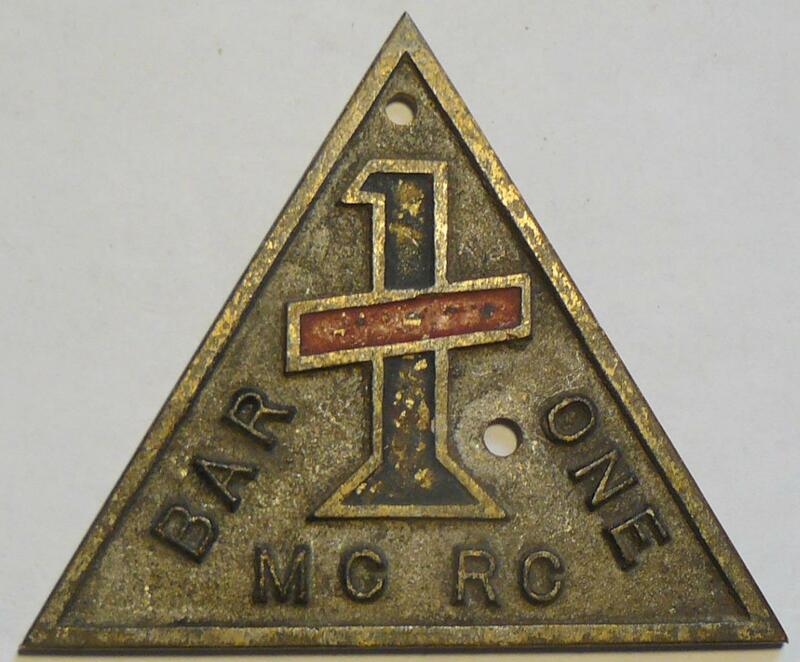 If one reads ‘Motorsport in Battledress – The Story of the Bar-None Motor Cycle Club’ you could believe that it was the principle, almost only, avenue for motor cycle sport under a Service umbrella. This absorbing history is however Cliff Gaskin’s personal record of the birth and early history of Bar-None racing and so understandably centres upon those particular events. For a wider understanding of racing in the Services a good read is Trevor Davies’ excellent ‘Warzone Speedway -The story of Armed Forces Racing’ which provides lots more detail relating to the Bar-None MCC but also documents his extensive research of how Speedway became an important recreation, diversion and entertainment for personnel whether as participants or spectators. Lots of information can be gleaned from these books about the innovative manner by which Service machines were modified and improved to make them more competitive. The Bar-None club started after an announcement was placed in the Egyptian Gazette announcing the intention to form a motor cycling club and which asked interested persons to come forward. 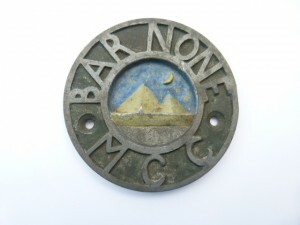 A meeting was subsequently held in Cairo, May 1944, at which the aims and rules of the ‘Bar-None Motor Cycle Club’ were drawn up. 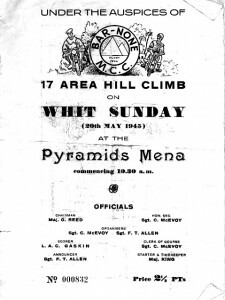 Club activities were at first restricted to discussions, talks on motor cycles, engineering subjects, and pre-war motor sport but soon developed with the introduction of a trials event in October 1944. Although not organised by the Bar-None club there were also regular impromptu meetings taking place at the Royal Artillery deport at Almaza, east of Cairo. This point is important as it clearly demonstrates that the Bar-None club was not the sole birth-place of organised motor cycle sport in Egypt. Indeed, the first competitive practice rides for Bar-None members (according to Cliff Gaskin) were a due to the generosity of the R.A. members who freely shared their machines. Subsequent major competitions organised under Bar-None auspices included hill-climbs, a scramble, a cross-country event and sand trials – desert speedway ! The Bar-One club-nights were at the Pear Tree Inn, Dawly Road, Hayes, on a Wednesday evening. Regular weekend runs were made to grass-track and scramble events and in June ’39 three members gained their Gold Stars at the Brooklands circuit by lapping in excess of 100 mph. V.H. Willoughby rode a 348 cc Velocette (Vic Willoughby later became staff man for The Motor Cycle), M. R. Tufnell a 998 Vincent-HRD and G. E Gott a 499 Vincent-HRD – these men were certainly serious about their sport. It is sad to note that G. Edgar. Gott died aged 32 whilst practising for the 1946 Belgium Grand Prix. Club Meetings continued weekly throughout 1939 and most of 1940 but by late that year wartime constraints including petrol rationing meant that meetings became restricted to a monthly social. 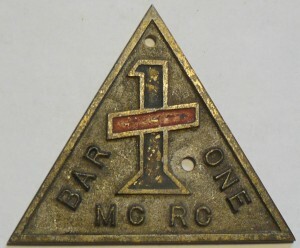 Unlike many clubs the Bar-One survived throughout the war until in March 1944 when its name was changed to ‘Southern Sporting Motor Cycle Club’. Records of the voting to rename the club confirm that many of the club’s members were serving in the forces.